In Saudi Arabia, everyone learns to program. Mobile device programming is now a required part of the High School curriculum. 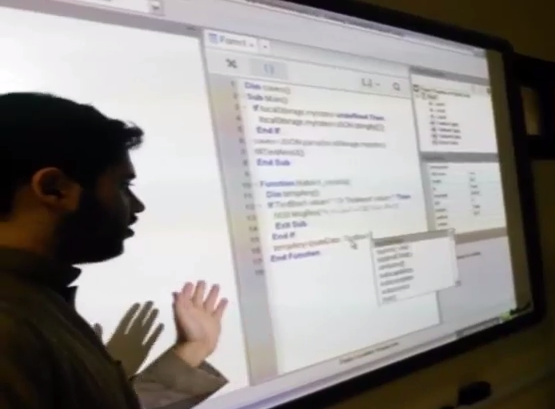 December 9, 2014 -- Saudi Arabia has added computer programming to its High School curriculum. Starting this year, all High School students will take a course in creating apps for mobile devices. About 450,000 students will learn programming each year. The vast majority of them have smart devices: iPhones, Android phones, tablet and iPods. Like everywhere, their devices are prized possessions, in use all the time. "The Saudi government has shown great foresight in teaching its students to program." said George Henne, President of NSB Corporation. "We strongly support education and believe that learning to program should be a core competency for all students. Saudi Arabia is now in the forefront of countries educating their students." Training is already underway, with the first class scheduled to complete in January 2015. The Ministry developed its own curriculum in Arabic for the course. The AppStudio IDE was enhanced to provide Arabic language and right-to-left text support. AppStudio includes over 150 statements and functions. Support is provided for SQLite, geolocation, graphics and more. A full set of standard screen input and output objects and dialog boxes are included. A handbook, tutorials and lots of sample code are included in Wiki form. The product is available immediately for download from the company's website. A single user license is available for $99.95 USD, and includes both the Mac OS and PC versions. Enterprise and Education licenses are also available. NSB Corporation's tools are among the most widely used third party tools for handheld devices. NSB Corporation has been a leading creator of development tools for handheld devices since 1993. Over 200,000 developers in over 80 countries use NSB's tools.